New Zealand’s signage manufacture and installation specialists. are New Zealand’s signage manufacture and installation specialists. National Signs are leaders in the New Zealand signage industry. We have the internal resources and capability to produce signage of any scope within the walls of our own premises. It doesn’t end with manufacturing and fabrication however, we stay true to our name and install signage on a national level at a standard that is unsurpassable. We were established as a full service, in-house signage company. This is contrast to the trend where others are moving away from in-house manufacture. Our company structure ensures that we have direct control over production, and see the entire process from design to installation. We set the bar for signage manufacturing quality and innovation in New Zealand. Our project management team is well versed in local and national council bylaws and consents, along with having the knowhow to ensure that public safety is never in question. With the resources we have along with our specialist signage installation teams, all projects we undertake are on spec, on budget, and on time. With over 20 years experience in the New Zealand signage industry, there’s little we don’t know when it comes to your signage. Our clients trust us with their brands, and so can you. Our clients trust us with their brands, and so can you. 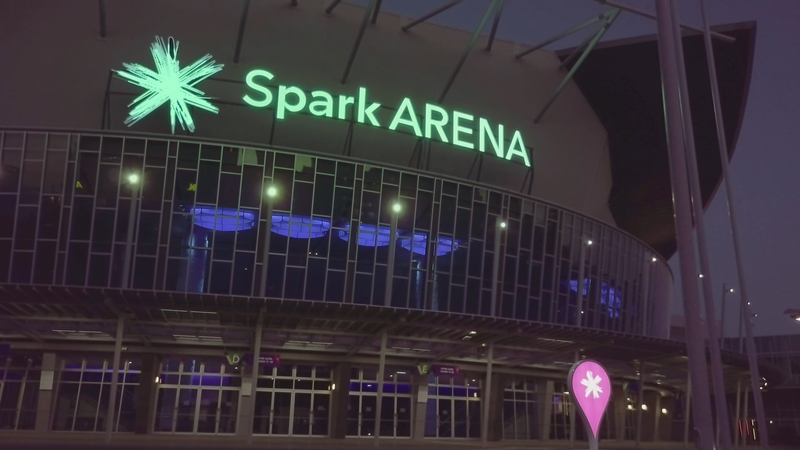 With Spark securing the naming rights for previously named Vector Arena - National Signs designed, manufactured and installed the signage package to suit their requirements. The project required a massive amount of resources and innovative thinking, with the end result being the spectacular signage that is in place today. Working together with Philips, National Signs used individual LED diodes to create a dynamic, illuminated version of the Spark logo. The 12,200 seat arena is visited by countless New Zealander's and tourists every year. The quality of materials and craftsmanship that went in to this project guarantees public safety and longevity of the signage for the entirety of their naming rights deal. Watch the video below to see our process of signage manufacture and installation. We set the bar for signage manufacturing quality and innovation in New Zealand. Occupying a prominent space on Ponsonby Road, Murder Burger needed some fresh and attention-grabbing signage. The fascia and tavern lightboxes were fabricated in-house at National Signs, complete with LED illumination. The case and panels of the fascia sign had to be router-cut to shape, and then painted and overlaid with translucent red vinyl. National Signs completed the new fascia signage at the Great Wall/Haval head office on Mt Wellington Highway. Complete with chrome logos installed to a silver alucobond fascia – the result looks stunning. National Signs manufactured and installed the signage at Continental Cars Ferrari in Newmarket. The signage package included 3D illuminated letters installed to the existing fascia, followed by a roadside pylon painted in-house to Ferrari’s international colour specifications. The logo at the top of the pylon is internally illuminated with white LED’s.